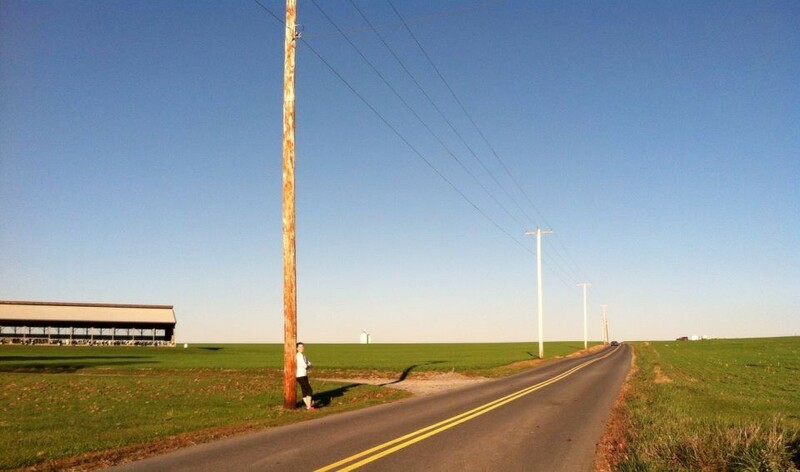 By the time I got to Oregon for the Rock n’ Roll, I was already a runner. I had signed up for the New York marathon and knew this would be my only race beforehand. Although I didn’t have a time goal, I was in decent shape and pumped to be in the great running state of Oregon with the support of Portland running friends. 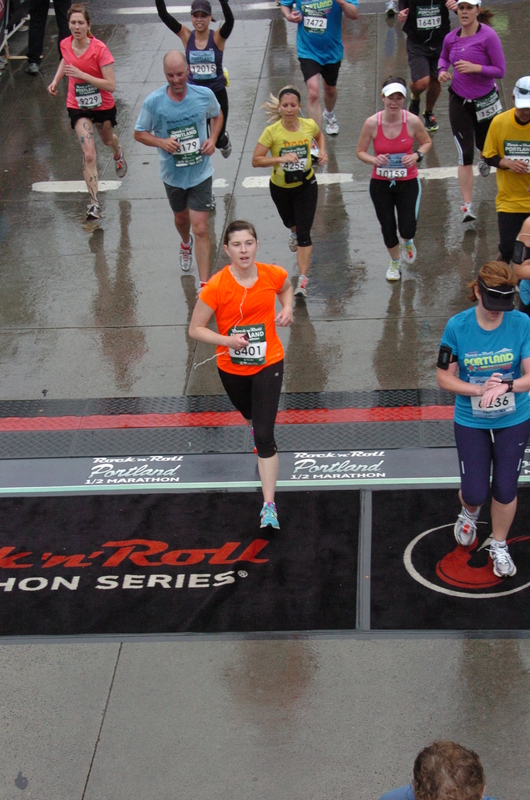 The Portland Rock n’ Roll half traverses several bridges and features bands scattered across the course. But, true to form, I was locked into my iPad waiting at the start, smiley, eager, and bopping around to Taio Cruz’s “Dynamite.” I was off like dynamite. Running in somewhat familiar territory was the perfect set up: I knew there were hills and bridges but not knowing exactly when they were coming up was the right amount of race day excitement. I ran by families sitting on their front stoops having coffee and eating breakfast, a charming vintage shop I vowed to return to when I had more time, and my friend Sarah who jetted around the city to wave and cheer at multiple points. Despite the gray, rainy weather, I was right on track. And then I saw a clock: I was way behind. How was I making (in my book) such bad time? “It must have been the hills,” I reasoned and pushed myself further. Around mile nine my time was still slower than I thought so I pushed myself even harder, up a hill, in the rain. I charged the end of the race like my legs would fall off and saw the clock: 02:12:03. 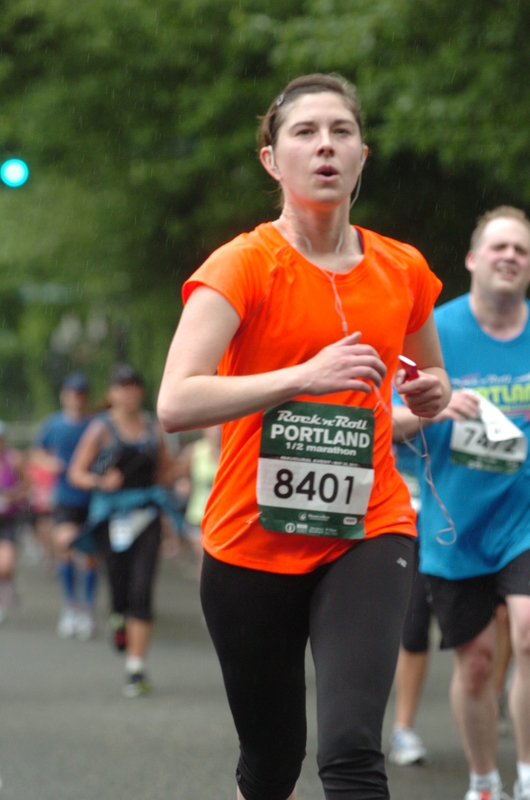 I felt I had run a great race, had a fun time, waved to the kind folks of Portland, and pushed myself harder than ever but was still disappointed. I shared this with Sarah, a seasoned runner, on the dreary walk back to her apartment. She assured me that I had both done great and looked great on the course. Back at her house I showered, ate, and lay down on the fluffy comforter in her guest bedroom. Then I hopped online to check out the race results. There I was with a chip time of 2:01:24! Chip time is the time on your racing chip attached to your shoe. Thus, your accurate race time as it picks up the times you cross the start and finish lines. The clock time or gun time is measured by the time the race started. So, if a lot of runners start ahead of you (which is the case for me) your clock time will be noticeably slower than your chip time. The ten-minute-plus difference in my time was both a surprise and explanation. I had never run an average 9:16 mile. 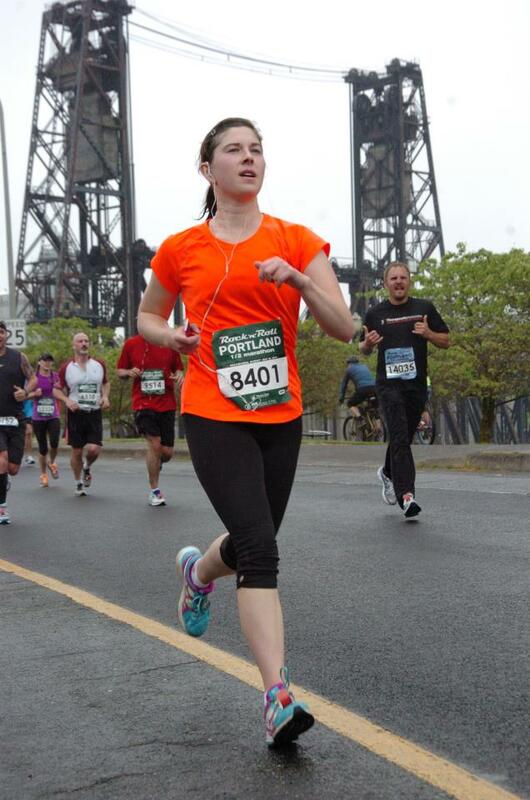 I couldn’t believe what I had been tricked into running—and yet I could believe it because I still felt it in my legs. With affirmation of my speed and a newly found burst of energy I drove to the charming vintage shop I’d run by, bought a scarf and took myself out to lunch. Then my energy started to wane. After a long drive home to Seattle I felt worse and ended up home sick the next few days. I had pushed myself too far. But I had still done it. After the chip time/clock time lesson I could really call myself a runner. 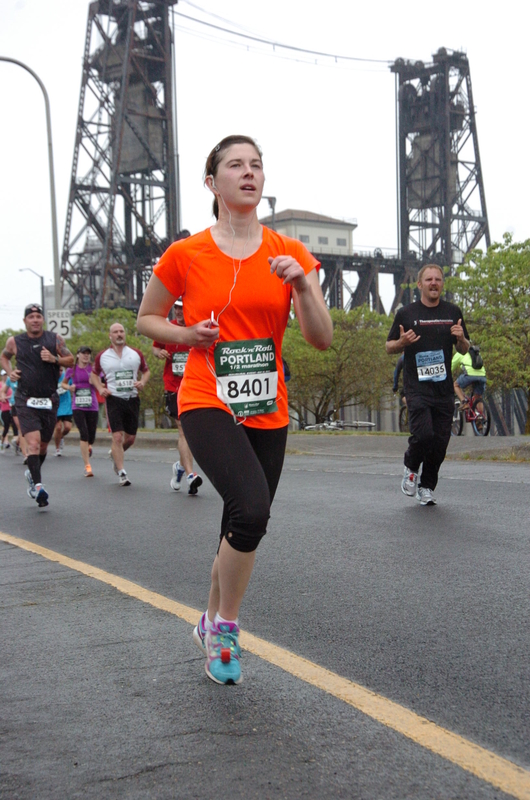 A runner who was ready to break a two-hour half marathon.